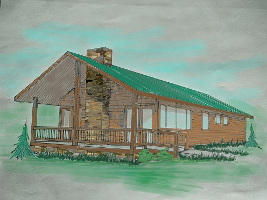 Because this home is to be built in various locations, it did not need to be designed to fit a specific property. Instead it needed to be designed to be versatile, to fit many properties. I spent some time thinking about this. One way to reduce cost was to have the most simple roof possible, a rectangle shaped gable. This roof needed to extend over a covered entry and a porch. By combining the porch and covered entry into one area, we save cost. The roof would be supported by a load bearing center wall, allowing the use of lower cost rafters. The dimensions needed to be a multiple that would reduce wasted materials, 24 feet by 56 feet. If the site is not too steep, an insulated concrete slab would be used. This is quicker, less costly, and easier to connect to a wheelchair ramp as shown in the rendering. To reduce energy costs, the largest glass was kept under the porch roof, in case it might face the hot afternoon sun. The roof and walls were designed for more efficient spray foam insulation. A space was reserved near the hall bath for the HVAC unit. The ductwork would run in a chase under the cathedral ceiling. By keeping the entire system inside the insulation envelope, the heating and cooling load is greatly reduced. A much smaller, and lower cost HVAC system would handle this load. It would also use much less energy. To make the plan more versatile, I included a large, open great room. The living room section was longer and narrower to allow for more options for furniture layout. A square room would fit less furnture and waste more space. The optional fireplace was placed on an outside wall to allow for more options like improved venting, an outside grill hook up, and the fireplace is visible to the entire area without interfering with furniture placement. The dining and kitchen bar have space to serve up to 11 people. The bedrooms are small, but efficiently laid out for large beds and furniture. The master closet is not in the best location, but a different location would have required adding square footage and cost. If mirrored bifold doors are installed, the bathroom will feel bright and open. The hall bath access is around the corner for privacy to the second bedroom. The washer and dryer are located on an exterior wall for improved ventiltion and efficiency. The entire plan is laid out to be easier for a wheelchair. More energy efficient, improved wheelchair accessibility, easier to build, and less cost make this plan attractive to the buyer and seller.